Who would’ve thought I could feel like I was on vacation simply by having a few drinks on a neighborhood roof deck? 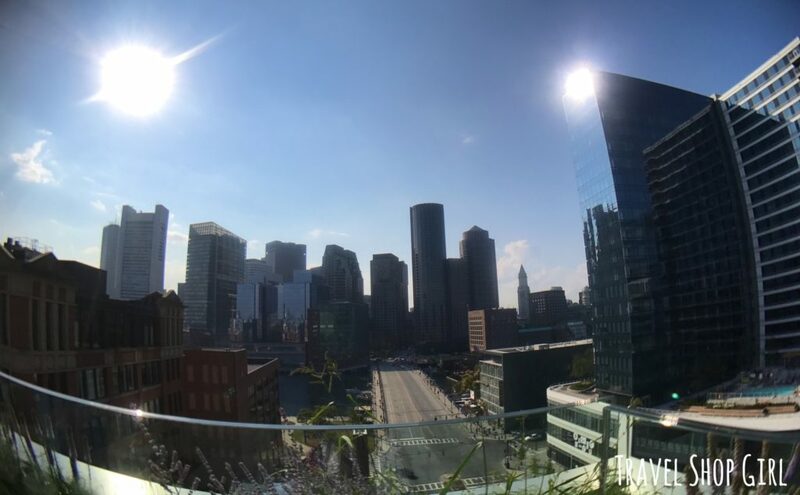 The YOTEL Boston Sky Lounge in the recently opened YOTEL Boston, features panoramic views from the 12th floor rooftop terrace. Having previously stayed at YOTEL New York, I knew how fresh and fun a company it is and how unique it would be for Boston. The city I live in is definitely all about tradition and while YOTEL is different, change is always good. 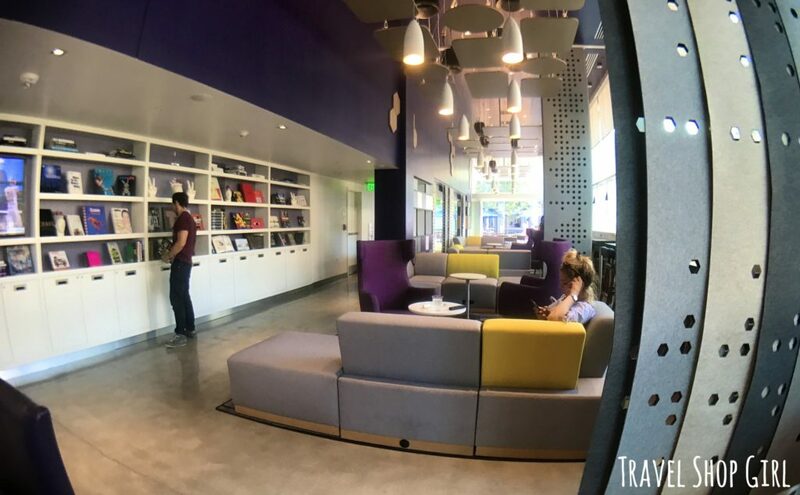 YOTEL Boston opened in June 2017 in the Boston Seaport district, one of Boston’s up and coming neighborhoods and it also just happens to be where I live. I watched the construction of YOTEL Boston and was happy to see it finally open its doors. 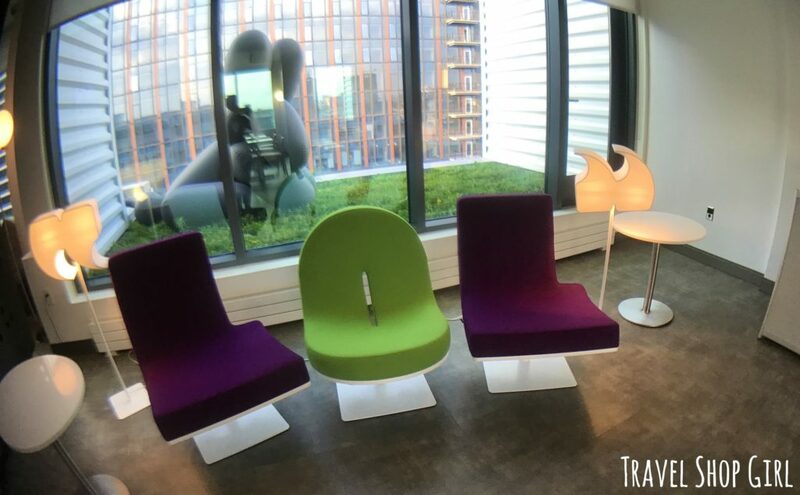 TSG Tip: Unfamiliar with Boston, but want to visit YOTEL Boston? Take the MBTA’s Silver Line (SL1) to the Courthouse stop, which is located in the basement of YOTEL Boston. Did you know that you can ride for free inbound from Boston Logan airport to South Station on the Silver Line? It’s unusual for me to show up early for anything, but we actually arrived before the YOTEL Boston Sky Lounge opened at 5 pm. Since we had to wait, the staff suggested having a drink in the lobby bar or Club Lounge. TSG Tip: Did you know that YOTEL Boston is the first YOTEL brand to have its own in-house restaurant and bar service? There were only a few customers here so Juan the bartender was able to take care of everyone quickly, including the two of us. I looked over the cocktail menu while Mr. TSG decided he was all about the Harpoon Wannamango beer on tap. My cocktail of choice was the Pina Caliente made with Hornitos Plata, jalapeños, ancho liquor, and pineapple. Juan advised me that the drink was spicy, but I like my drinks spicy so his advice didn’t scare me at all. My tall drink arrived and was a lovely pineapple hue and Juan wasn’t kidding. While it starts off sweet from the pineapple, it finishes hot and spicy and was a great way to kick off my birthday week. TSG Tip: While the menu omitted the necessary tilde over the n in “Piña” and “jalapeños,” this is a reminder to businesses everywhere that “n” and “ñ” are simply not the same thing. Not wanting to look too eager, we waited until several minutes after 5pm before heading up to the Sky Lounge. 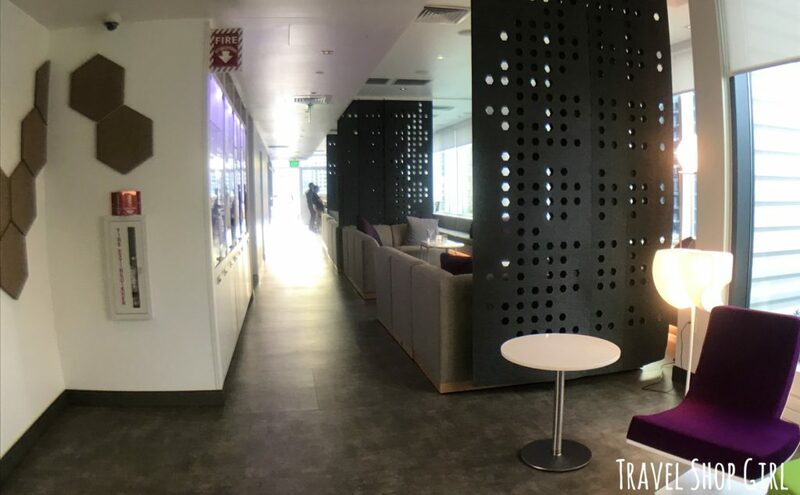 Walk through the lobby to the elevator bays on the left and up to the 12th floor to discover YOTEL Boston Sky Lounge for yourself. Before you get to the rooftop terrace, you’ll pass private cabins on the left and this cute seating group on the right. Can you see what it says? We were one of the first ones outside and had our choice of seating. I, of course, had to take pics as soon as I got there. Then I chose out one of the comfy couches although there are chairs, bench seating, and bar height seating available. It wasn’t long before the YOTEL Boston Sky Lounge filled up and people were waiting for open seats. And it was a Tuesday night. 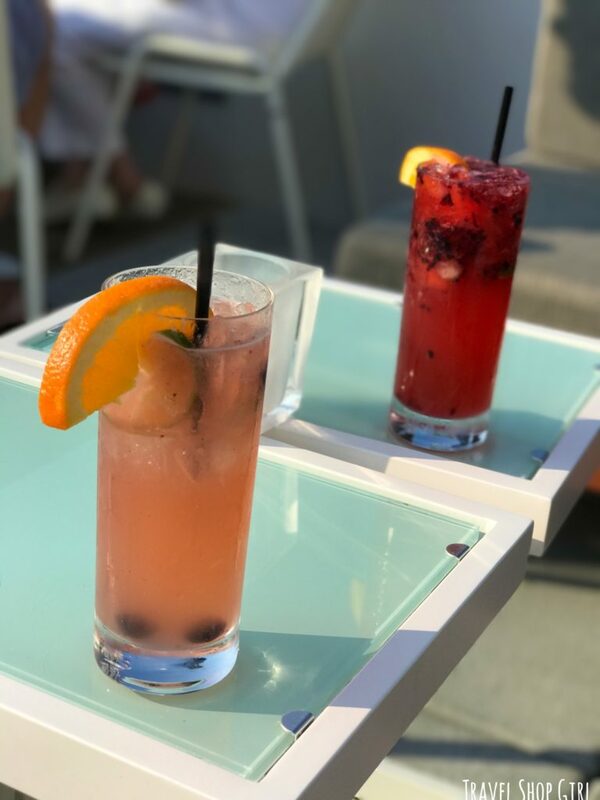 TSG Tip: The YOTEL Boston Sky Lounge is open from 5 pm – 1 am Sunday to Wednesday and from 5 pm – 2 am Thursday to Saturday for guests 21 years of age and older. 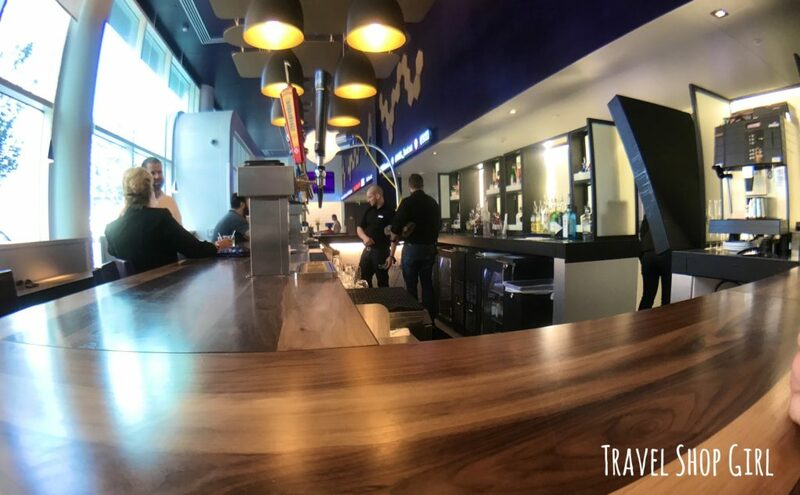 Guests can enjoy cocktails and light bites out in the Sky Lounge with table service provided by servers. Our server was Yannett, a thoughtful and professional server who was first a YOTEL fan after staying at YOTEL New York. 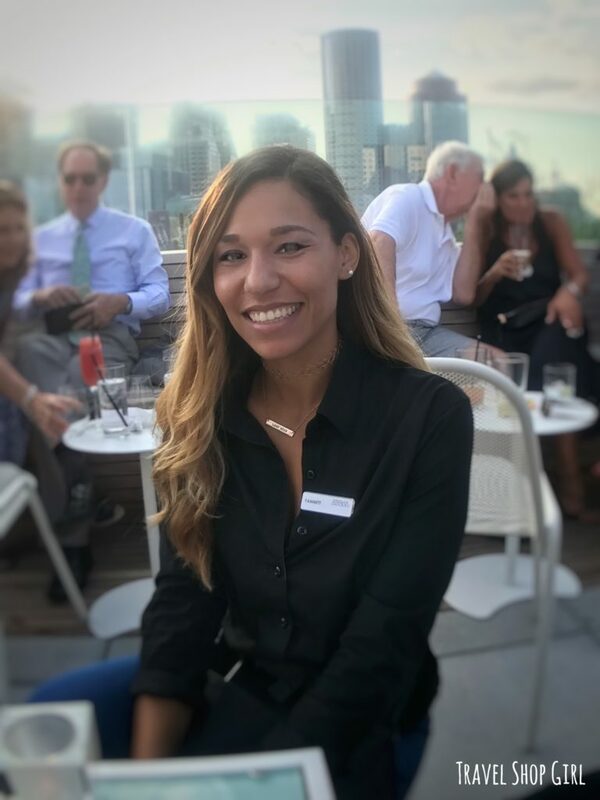 When she learned that one was opening in Boston and at the same going through a career change, Yannett (pronounced Jannette) was elated to begin a career with YOTEL Boston. 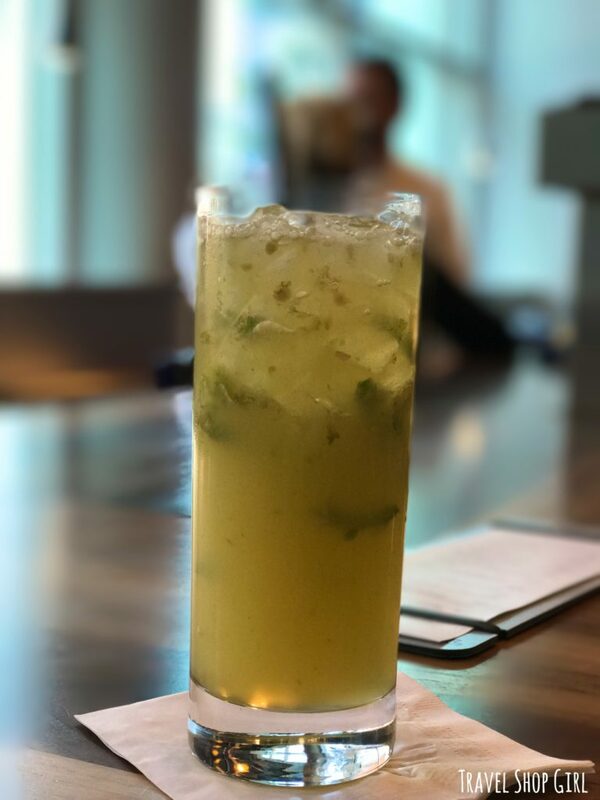 Wanting to explore the cocktail menu, we asked Yannett to tell us what were some of the most popular drinks. 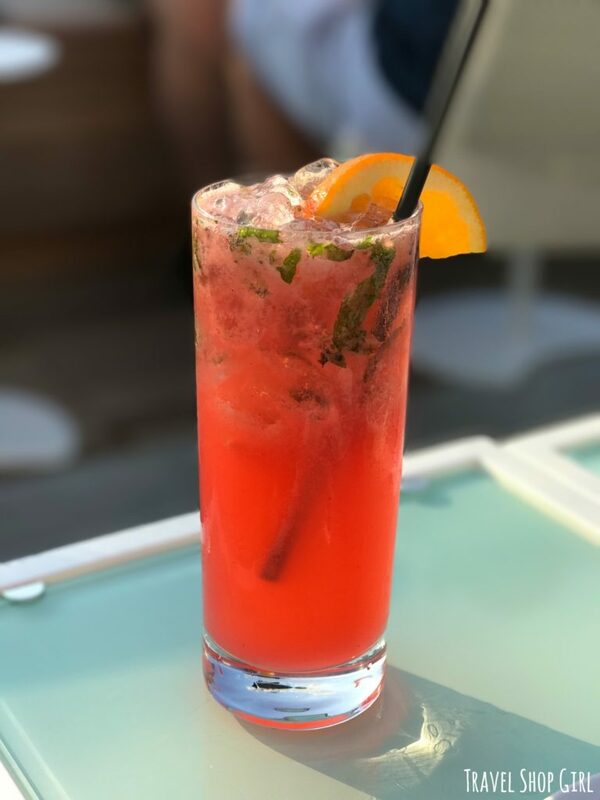 She suggested the Righteous Ricky (Absolut Lime Vodka, strawberry, and blueberry) and Pier Pressure (Tanqueray, Tyku Cucumber, blackberries, mint, and cucumber). 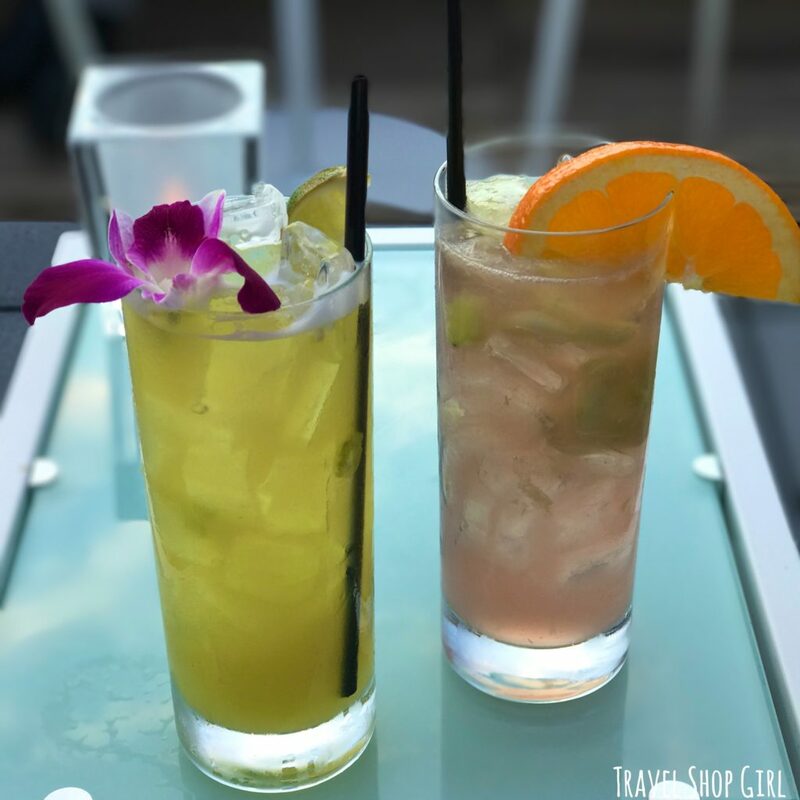 Both were light and refreshing and I have to say, the perfect kind of summer drink I want to sip on when sitting outside in the sun. Mr. TSG came straight from work to meet up with me so he was starving. He ordered a few little plates to nosh off of while sipping on his cocktails. 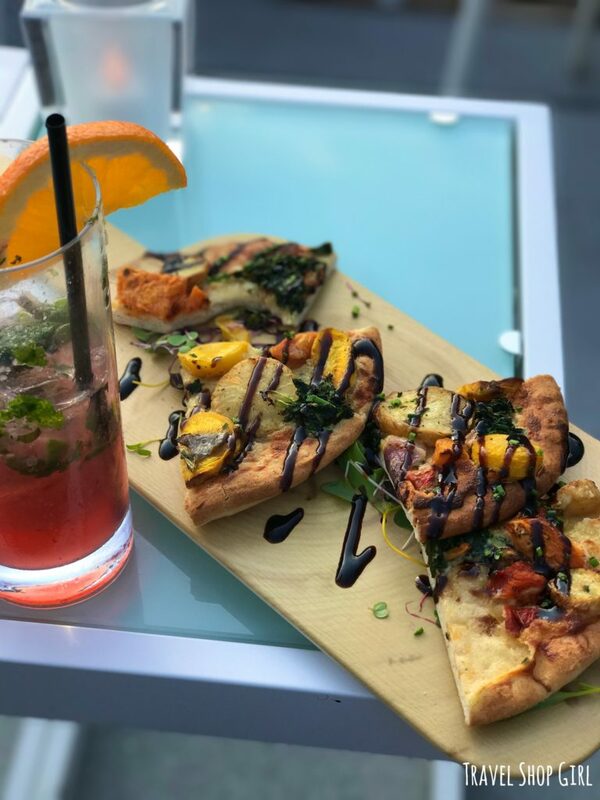 Unfortunately, all items on the menu are either meat based or contain dairy so the best I was able to do was pull some veggies off his flatbread pizza, which he ordered minus the bacon. 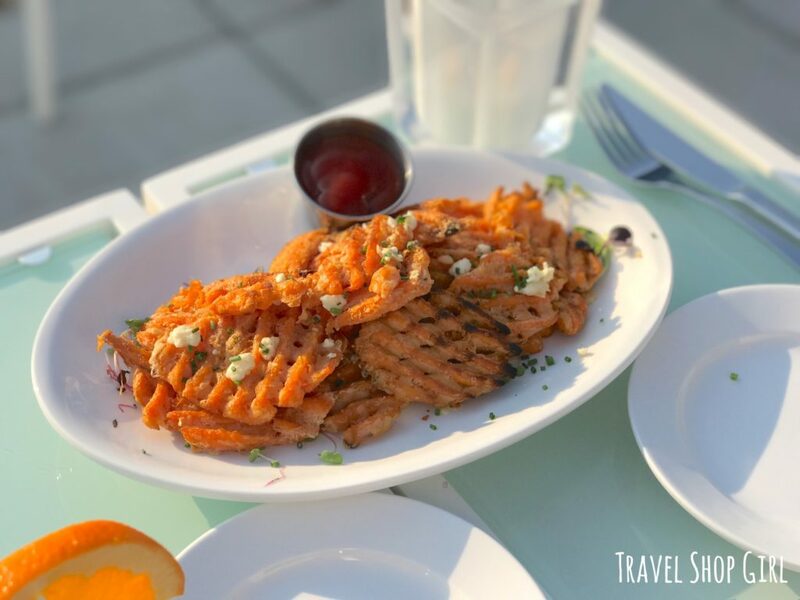 The little sweet potato waffles, also minus the bacon, were more like sweet potato waffle fries, but he didn’t seem to mind. 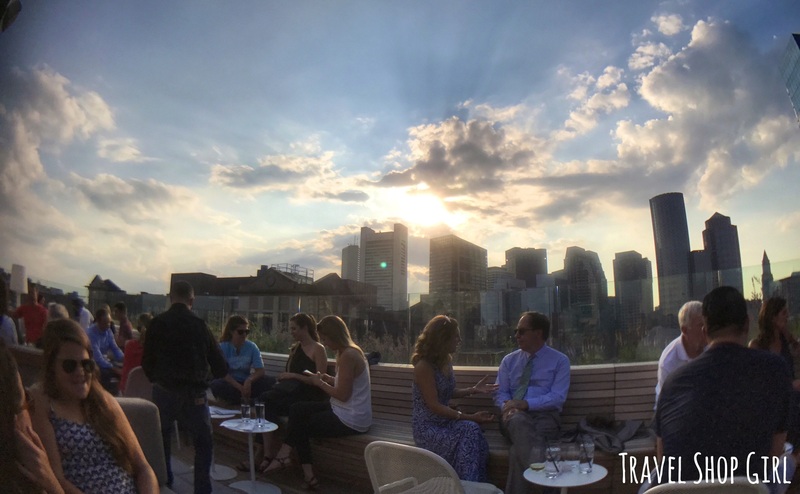 In between drinks, I didn’t overlook my stunning view of the Boston skyline and the sun as it was starting to set. How lucky am I to be here and that this is all in my neighborhood? When you go out for a drink, eventually you’re going to need to use the restroom. Nothing’s worse than a dingy bathroom that’s not stocked with supplies. 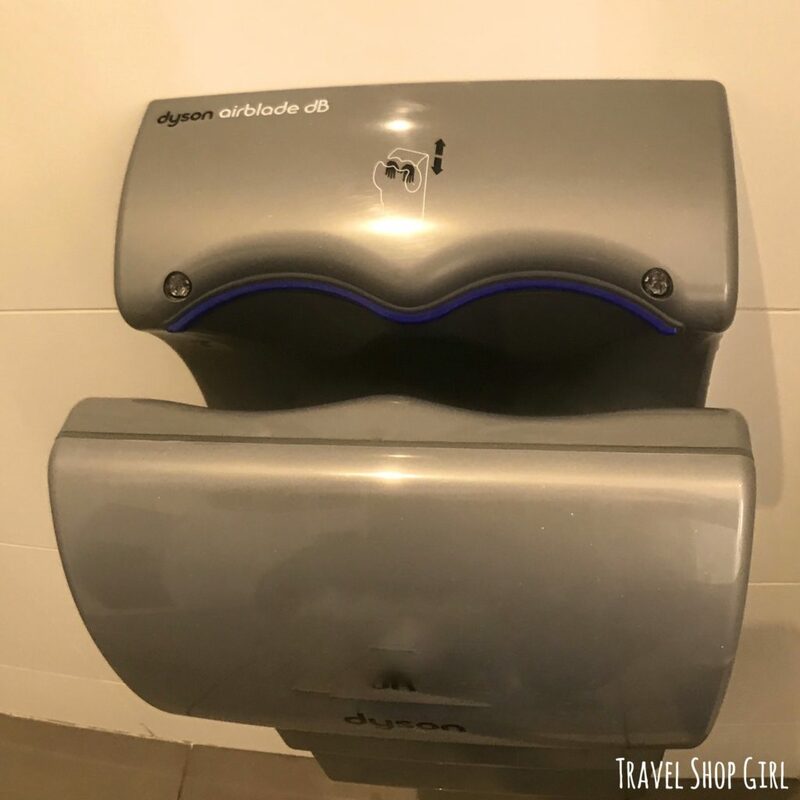 The women’s restroom on the 12th floor of YOTEL Boston was huge, clean, well stocked, and even had one of my favorite things in the world, a Dyson Air Blade hand dryer. No cheap knockoffs here, just the original and yes, I took a pic of it in the bathroom. We ordered one last drink before leaving and I went back to my new cocktail favorite, the Pina Caliente and Mr. TSG went all out and tried Menino’s Grand Vision (Bacardi Dragonberry, Makers Mark, Canton Ginger Liqueur, pama, lime, and cucumber). Since Mr. TSG loves his bourbon, this cocktail was definitely one for him. 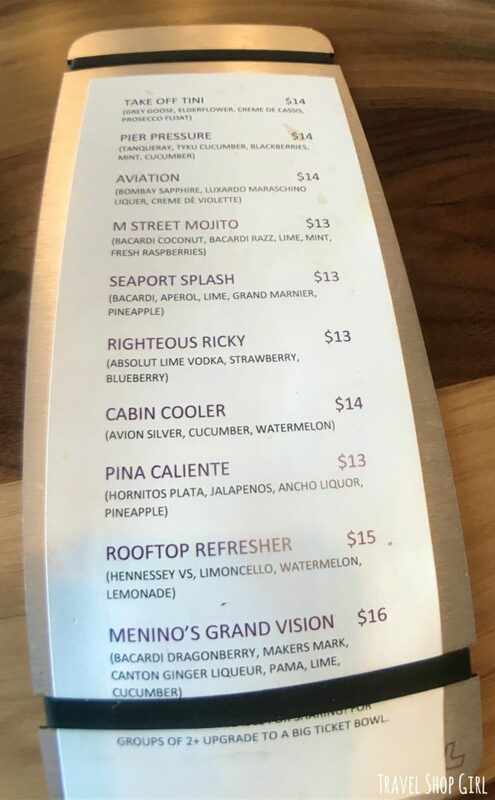 The consistency in the quality of the cocktails and service at YOTEL Boston Sky Lounge is one reason that I told Yannett and the bartenders that they would all see me again soon. YOTEL Boston Sky Lounge definitely made me think differently about hotel bars, especially one in my neighborhood. Sitting up high on the 12th floor overlooking Boston, I felt like I was on vacation and didn’t have a care in the world. Who doesn’t want to feel like that? I’m definitely going back. After all, I still have five cocktails on that menu to try out. Where do you like to go for drinks locally that makes you feel like you’re on vacation?